Would you let your children go outside in the middle of winter without shoes and a coat? More than likely me even asking that question sounds a bit insane if you aren’t fairly close to the equator. While we would never consider doing it to our children, some people will leave their dogs outdoor during the winter all year long. There are a lot of misconceptions out there about dogs and the ability to survive out in very cold temperatures. While some dogs do just fine outdoor (yes, the malamute and husky), it sometimes isn’t the best answer, especially with dangerous temperatures and snow. Lets also take into account that many, if not most, dogs want to be with their pack and family..or in other words, you. If you have dogs that prefer being outside, however, it is important that you take precautions to keep them happy and healthy. That being said, there are a lot of dangers out there for dogs during the winter and as their humans, it is our job to keep them safe, warm, and with a full belly. 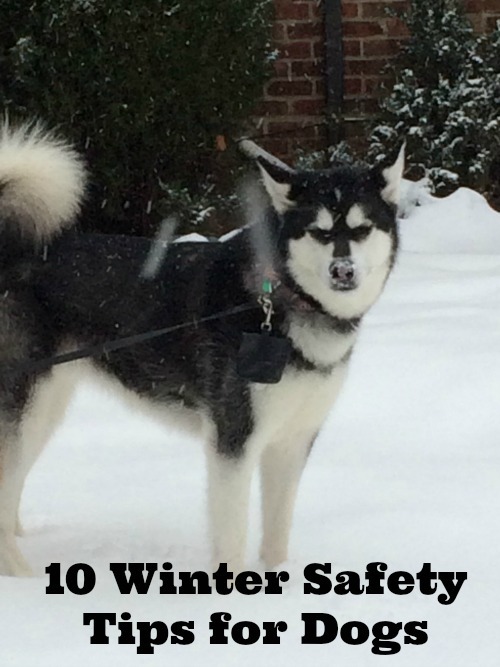 Knowing that there are a lot of confusion when it comes to dogs and winter, I included below some of my favorite winter safety tips for dogs! Limit Time Outdoors. – End of the day, the safest dog is a dog that stays indoor during the winter. Limit time outdoors, especially during dangerous temperatures since frostbite is a major concern for dogs. Bundle Up. – Like us, short haired and small dogs need to bundle up. The same is true for puppies. To keep them warm, purchase a winter coat or sweater to wear outdoors. This will help them better regulate their body heat. Clean Paws Are Happy Paws. – Whenever your dog comes inside, clean their paws thoroughly and put petroleum jelly or conditioner on their paw pads to keep them from cracking. You want to also make sure you clean off any sand or salt since it can damage our poor pups’ feet! Beware of Antifreeze. – This is a big one for cats and dogs alike. Antifreeze tastes sweet and is very deadly. Keep them away from unknown ice and puddles in driveways and parking lots. Shelter. – If your dog must be an outdoor dog, make sure they have proper shelter. This should have a foundation off the grond and be very well insulated. Your dog should have enough room to lay down and circle, but a small enough space that that they can heat it themselves and stay warm. In other words, follow proper crate sizing rules. Beware of Frozen Water. – Even though lakes and rivers may look frozen, keep your dog well away. This can be dangerous for you and your dog both if the ice breaks. Proper Grooming. – As silly as it may sound at first, grooming is very important during the winter to make sure dogs fur doesn’t get coarse. Fur that is coarse has issues keeping your dog warm. This will also keep any loose hair under control! (contrary to popular belief, it won’t make them lose their winter coat – promise. That is genetic programming, not brushing.). Towel & Blow Dry. Whenever you dog comes in from the rain or snow, dry them thoroughly. This will get them warm and keep them from getting sick. Don’t Leave Dogs in the Car. – Even though you don’t have to worry about heat, cars are just as dangerous during the winter. An engine that is turned on to keep your dog warm can put your dog’s life in danger due to carbon monoxide if anything has damaged your engine. If the engine is off, your dog may get too cold. Just bring them in with you or leave them at home. It will be safer. Extra Calories. – If your dog is spending lots of time outdoors or in cold areas, they will need plenty of extra calories. The extra food will help them better regulate their body temperature, especially if they are outdoor dogs or work dogs. For exact calorie needs, talk to your vet. Also, please please please be mindful of human food, especially with many of us staying indoors more. If you aren’t sure, here is a great list of what not to feed dogs. While calories are extremely important, it is also important you keep your dog on a healthy diet with nutritious food. Thank your for the refresher on winter safety tips. Common sense prevails in most areas, but I did not realize that the brushing was so important. This is a VERY timely post, and temps around here are below zero. Yes, the temperatures are frightening here too. I recently learned about the brushing one too and was shocked! I felt terrible since we used to brush LESS in winter since I thought the looses fur would help. Eep! Very good tips. I don’t know what makes some people think just because an animal has fur that they’ll be warm.A few years ago a neighbor had their dog chained out back. It was covered in snow because it was on a short leash. I called animal welfare. I just couldn’t sit back and do nothing. I HATE seeing things like that! Most dogs just can’t handle those temperatures, even the arctic breeds. While they ‘used’ to do it on sled teams, it usually shortened their lives. Dogs need to be indoors or in heated shelter – period! These are great tips. I wish more people would follow them. I don’t understand how some people can leave there animals outside for long periods of time in this freezing cold. It makes me so angry! Thank you so much for this post. I have 3 dogs and they are very small and cannot take the cold too well. You brought up some things that I didn’t know (or think about). There are good ideas. I live in a townhome with rows of neighbors who have a dog let out in their yard all day. I makes me crazy to hear the dogs barking all day in sub-zero temps while the homeowners are at work. If you do not have an alternative for your pet, perhaps you should not have one. Just my 2 cents worth. Awesome tips, Just the other day we were waiting for the light to turn green and someone had left their dog in the car and it was an ok day not too cold and not too hot not only did they leave their dog in the car but they left the window all the way down and the dog saw another dog across the street and was about to jump out the window. I can’t believe people leave their animals out in the cold and in the cars. I am so happy you made a post about this. I am in Florida but share rescue dogs from all over the Country. I see horror stories all winter about dogs left outside in horribly cold conditions. States are starting to enact cruelty laws against animals left out in freezing temperatures so if people witness this they need contact the authorities to see if anything can be done. Excellent tips! With this winter going out of its way to bluster everywhere, these are very timely. When my dogs come in from outside in the snow (and we have 2 feet of it here in NY!) they also have snow and ice in between the pads of their paws. I always take a towel and help get it out, and check to make sure there are no injuries. Generally, they enjoy a short time out in the snow. We actually had such a cold weekend we decided for the first time in years to not even go out. It was -17 and yeah – it wasn’t worth risking any potential problems for our daily walks. We stayed inside and did lots of fun indoor games, and Laika didn’t seem to mind at all. Great tips and reminders about winter safety. Great tips and so important – paw care is a big one! It’s kinda hard to believe we had two experiences with salt this winter! Poo poo on salt – but my sisters paw is all better now! 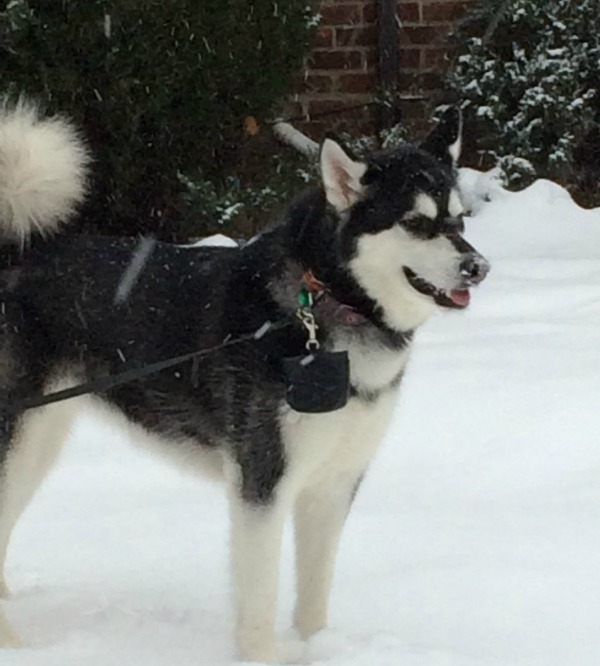 Thanks for writing all about how to care for doggies during the winter months! thanks for such great tips. its very important to look after dogs safety in such harsh weather and be carefull that they dont fall sick. Great reminders! This winter has been brutal for us! So my dogs stay inside except for short potty breaks. I hadn’t thought of the fact that they might need extra calories because of the cold.I always worry about them packing on extra pounds in the winter! Wow!Thanks for the info! I did not know some of these, especially about cleaning & putting petroleum jelly on the paws! This is a great list! My dog benefits greatly from the extra calories and bundling up. She’s little and her feet take the brunt of the cold, but her feet are too small for booties, so we wash and warm her feet immediately when she comes inside. Thank you for thew great info. I shall show my husband that my babies do need coats. Excellent health tips, although it’s hard for us to imagine the cold winters you’re having….it’s summer here right now and has been very hot! I can’t believe how cruel people cam be to animals. It actually makes me feel hurt when I see or hear about abuse. I know. 🙁 It makes me very sad but all we can do is educate and report animal abuse! Great tips here! I have two Siberian Huskies who have been in Arizona for the last 4 years, it was a shock for them moving back to Colorado. Now that they have adjusted I can hardly get them to come in some nights! Another good article might be safety tips for heat. The thing that is still big in my mind is hiking in AZ and seeing people have no water for their dogs or even just having their dogs with them on a super hot day. Our furry pets overheat much faster then we do! YES!!! I have this on my calendar for May. I see so many people walking without water for their dogs and its frightening. During the summer we have Reya walk with a backpack on her back. One side is her traveling water mug and the other is a liter of water. These are great tips! Your tip about ~ Beware of Antifreeze. Antifreeze tastes sweet and is very deadly. Keep them away from unknown ice and puddles in driveways and parking lots, is something I had never even thought about! We unfortunately, know this tip from personal experience. A very wonderful, sweet cat of my inlaws died from licking anti-freeze under a car when he snuck out of the house. I would never wish that on any animal! Thank you for the tips. I was not aware of some of the things you need to do to protect them. I’d like to add more tips. Never leave your dog while your heating equipment or furnace is running. The equipment will release carbon monoxide gas, which can endanger your dog’s life. They really do! I’m so glad it worked out and your pup was okay. I would have had a heart attack! Great tips !! As our dogs are inside dogs and spoiled. Reya knows all about that! 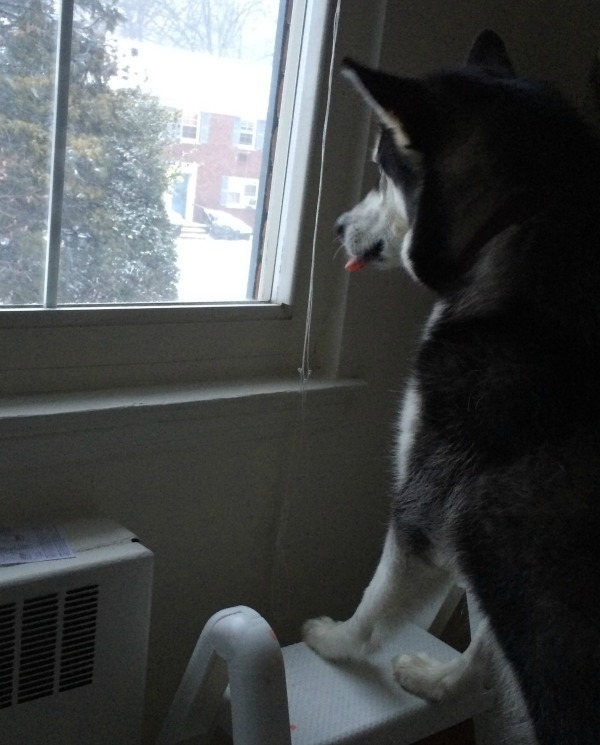 She pouts that mom won’t let her be an outside dog since she loves snow! We need to be very cautious during the winter. Thanks for the tips. I think they will really help.